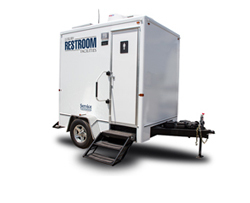 Restroom trailers are the perfect solution for any outdoor event or construction site where comfort and versatility are required. 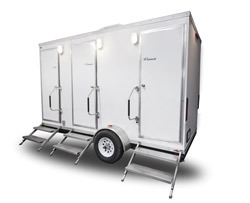 Unlike porta potties, bathroom trailers offer a variety of features and amenities much like that of a home restroom. Custom-tailored restroom facilities balanced between privacy and luxury while also providing a truly unique experience. The Blue Star trailers are equipped with unrivaled design and innovation to surpass all expectations with versatility being key. 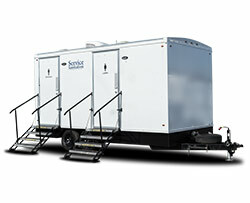 Unlike a plastic porta-potty, the Celebrity restroom trailer has the look and feel of a true home restroom. Standard equipped with climate controlled interiors, running water sinks and flushing toilets. Enjoy the comforts of home, even when you’re not! 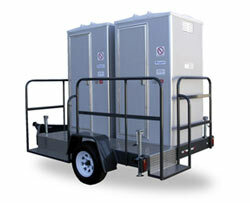 These trailers are ideal for applications where high demand is in effect and where special accommodations are required. Available in Indianapolis only, these trailers come in a variety of different shapes and sizes, each catering to a specific clientele. 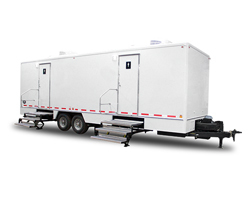 This 14′ trailer comfortably accommodates multiple patrons at once, making it ideal for commercial rental applications.